We athletes are driven and work very hard. Our bodies do a great job providing enough Vitamin D naturally, if we spend enough time in the sun. Even if we do, it still may not be enough. Plenty of athletes, especially indoor athletes, have insufficient levels of Vitamin D, even some are at the point of deficiency. This Vitamin is so crucial to our daily life. It helps us absorb the Calcium in our diet, which is crucial for bones, nerves, muscle growth, immunity, and blood pressure. In addition, it helps reduce colds or flus during the winter, provides better bone integrity and fewer breaks or micro-cracks, faster healing of injuries, and reduced muscle fatigue during and post-workout. Did you hear that? Reduced muscle fatigue! For an athlete, that means better and faster recovery times post-workout or post-competition! New research is beginning to reveal that post-exercise muscle fatigue is slightly lower and recovery happens slightly faster when an athlete has sufficient Vitamin D levels. When struggle to improve your performance through training, making this small addition to your nutrition will pay off with only a fraction of the effort. A sufficient level of Vitamin D serves the athlete well. It increases muscle protein synthesis, ATP concentration, overall athletic capacity, and it also prevents myopathy (a disease of muscle tissue), muscle inflammation, and pain. A deficiency in Vitamin D can actually cause those problems. 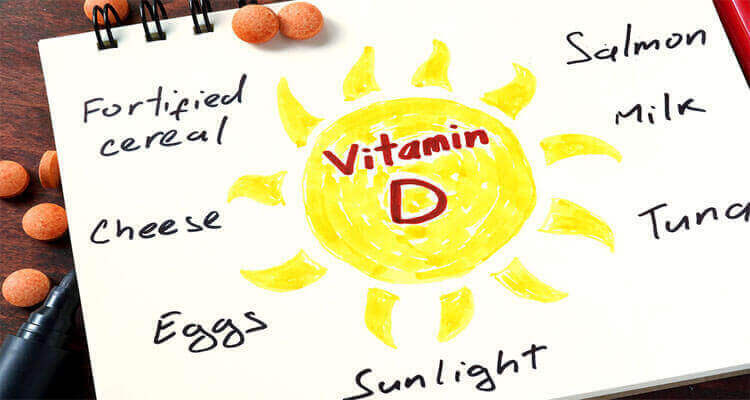 There’s no doubt Vitamin D is a crucial nutritional component in your daily dietary intake. It’s worth the effort to get your levels checked! Especially if you are feeling lethargic, notice a decrease in performance, or are not recovering very well. It’s a simple, fairly effortless adjustment to achieve a significant gain. However, getting more Vitamin D into your body isn’t as easy as sitting near a window at work or running in the sun with sunscreen all over your skin. The UV rays get blocked by the glass of a window or sunscreen as low as even SPF 15! Without the sun’s rays, Vitamin D isn’t metabolized. “D is for Direct Sunlight” – The best way to get your daily dose of Vitamin D is to be in the sun 15-30 minutes per day, except for the winter months when the sun isn’t direct enough (depending on where you live). The amount you will absorb also depends on several personal factors such as skin tone (darker skin actually has a harder time absorbing rays) and high body fat or diseases can hinder absorption. The second most effective way to get Vitamin D is through a supplement. This is when a person does not have access to direct sunlight or wants to avoid a lot of direct sunlight for skin cancer concerns. Recommended supplementation for Vitamin D is 600-2000 units. Thirdly, and hardly worth mentioning, you can find Vitamin D in certain fortified foods, but not even close enough to the amounts you need. Athletes can really notice a difference when their levels of Vitamin D are optimal. If you aren’t supplementing, consider trying it. If you already are but you aren’t sure what your levels are, go see if you’re in the sufficient zone and do what it takes to get there.